Les Misérables trailer is out. (Please scroll down.) You can hear Anne Hathaway's miserable Fantine singing “I dreamed that love would never die … I had a dream my life would be so different from this hell I'm living.” All the while, dialogue-less bits from the film are shown featuring Hugh Jackman as Jean Valjean, Russell Crowe as Inspector Javert, Amanda Seyfried as Crosette, and Eddie Redmayne as Marius. I believe that even those who aren't fans of modern Hollywood musicals (or Broadway musicals) will agree that the Les Misérables trailer looks impressive. As for Anne Hathaway's rendition of “I Dreamed a Dream,” it sounds equally impressive. Best Actress Oscar nod? 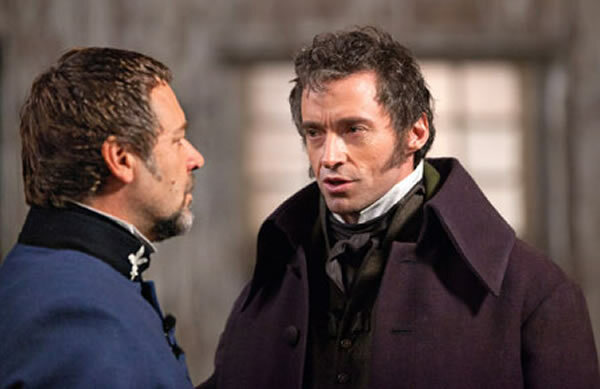 Another question: Apart from the pathological Javert, why aren't the villains shown in the trailer? Or did I miss them? The big-screen version of Claude-Michel Schönberg and Alain Boublil's Tony Award-winning stage musical, itself based on Victor Hugo's novel, opens Dec. 14. Tom Hooper, Oscar winner for The King's Speech, directed. The Les Misérables screenplay is credited to William Nicholson, whose previous efforts include Michael Apted's Nell, Richard Attenborough's Shadowlands, and Ridley Scott's Best Picture Oscar winner Gladiator. In addition to Tony Award winner Hugh Jackman (The Boy from Oz), Oscar winner Russell Crowe (Gladiator), The Dark Knight Rises star and Oscar nominee (for Rachel Getting Married) Anne Hathaway, Mamma Mia! 's Amanda Seyfried, and My Week with Marilyn's Eddie Redmayne, the Les Misérables cast includes two-time Oscar nominee Helena Bonham Carter (The Wings of the Dove, The King's Speech) as the villainous Madame Thénardier; The Dictator's Sacha Baron Cohen as Monsieur Thénardier; and Colm Wilkinson, Jean Valjean in the original West End production, as the Bishop of Digne. Also in the musical's cast: Samantha Barks, Aaron Tveit, Ella Hunt, George Blagden, Bertie Carvel, Daniel Huttlestone, and Isabelle Allen. Anne Hathaway / Les Misérables picture: Universal Pictures. Les Misérables, of course, will arrive covered with a patina of “prestige.” In addition to Tony Award winner Jackman (The Boy from Oz), and Oscar winners Crowe (Gladiator) and Hooper, the film's cast boasts the following: The Dark Knight Rises star and Oscar nominee Anne Hathaway (Rachel Getting Married) as Fantine; two-time Oscar nominee Helena Bonham Carter (The Wings of the Dove, The King's Speech) as the villainous Madame Thénardier; Mamma Mia! 's Amanda Seyfried as Cosette; My Week with Marilyn's Eddie Redmayne as Marius, The Dictator's Sacha Baron Cohen as Thénardier; and Colm Wilkinson, Jean Valjean in the original West End production, as the Bishop of Digne. The Les Misérables screenplay is credited to William Nicholson, whose previous work includes Michael Apted's Nell, Richard Attenborough's Shadowlands, and Ridley Scott's Best Picture Oscar winner Gladiator. Among Les Misérables' producers are Eric Fellner and Tim Bevan (Tinker Tailor Soldier Spy, Senna). Cinematography by the Oscar-nominated Danny Cohen (The King's Speech). Production design by two-time Oscar nominee Eve Stewart (The King's Speech, Topsy-Turvy). Costume design by The Skin I Live In / Bad Education's Paco Delgado. Les Misérables opens December 14. Also in the musical's cast: Samantha Barks, Aaron Tveit, Ella Hunt, George Blagden, Bertie Carvel, Daniel Huttlestone, and Isabelle Allen. The Exorcist, a 1973 Best Picture Oscar nominee and major worldwide blockbuster, will be remade as a television miniseries according to various online reports. Based on William Peter Blatty's 1971 novel, the William Friedkin-directed horror movie about a girl possessed by the devil starred Ellen Burstyn, Linda Blair, Jason Miller, and Max von Sydow. Blatty himself penned the screenplay adaptation. According to Vulture, Martha Marcy May Marlene's writer-director Sean Durkin will both write and direct the ten-episode TV version of The Exorcist. If ten episodes seem more than a little too long, that's because the new version will include a prequel to the events found in Friedkin's film. Friedkin's The Exorcist received 10 Academy Award nominations. In addition to Best Picture, also shortlisted were William Friedkin, William Peter Blatty, Ellen Burstyn, Linda Blair, and Jason Miller. The film earned Oscars for Blatty and for Best Sound. Linda Blair / The Exorcist photo: Warner Bros.
Jean-Luc Godard at your local multiplex? Well, not exactly. Although the French-born, Swiss-based Godard, 81, is currently working on a 3D movie project, it's not a Transformers or a Men in Black sequel. Under the aegis of Wild Bunch, Godard's first 3D foray is called Adieu au langage / Goodbye to Language. According to Screen International, Goodbye to Language “explores cinema's search to reinvent itself with the language of 3D through a couple's efforts to communicate to save their relationship.” In the cast: Héloïse Godet, Zoé Bruneau, Kamel Abdelli, Richard Chevalier, and Jessica Erickson. 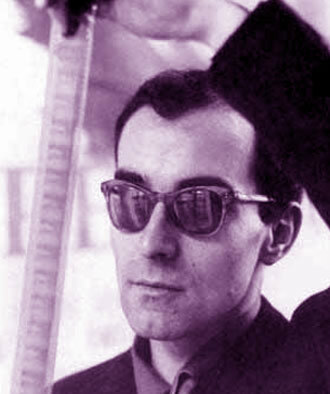 Shooting, with Godard's own cell-phone-based “rudimentary” 3D camera, should begin in the summer. Previous arthouse filmmakers who have toyed with 3D include Wim Wenders (Pina) and Werner Herzog (Cave of Forgotten Dreams). Roman Polanski is everywhere at the Cannes Film Festival. Polanski is the subject (and interviewee) of Laurent Bouzereau's documentary Roman Polanski: A Film Memoir. He unveiled a restored print of his 1979/1980 Best Picture César and Oscar nominee Tess, starring Nastassja Kinski. And he is the director of the short film / Prada commercial A Therapy. Co-written by Polanski and The Ghost Writer's Ronald Harwood, A Therapy boasts music by The Queen's Alexandre Desplat, gorgeous cinematography by Girl with the Pearl Earring's Eduardo Serra, production design by The Godfather's Dean Tavoularis, and editing by The Pianist's Hervé de Luze. 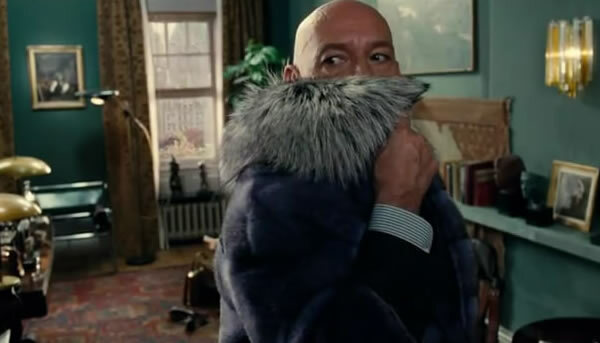 Ah, and costume design by, I guess, Prada itself. Really, how many feature films get that kind of talent both in front and behind the camera? Roman Polanski won a Best Director Academy Award for The Pianist in early 2003. Among his other movies are Knife in the Water (1962), The Fearless Vampire Killers (1967), Rosemary's Baby (1968), Chinatown (1974), The Tenant (1976), Frantic (1988), Bitter Moon (1992), and Carnage (2011). Polanski's next project is called D., based on the Dreyfus Affair. 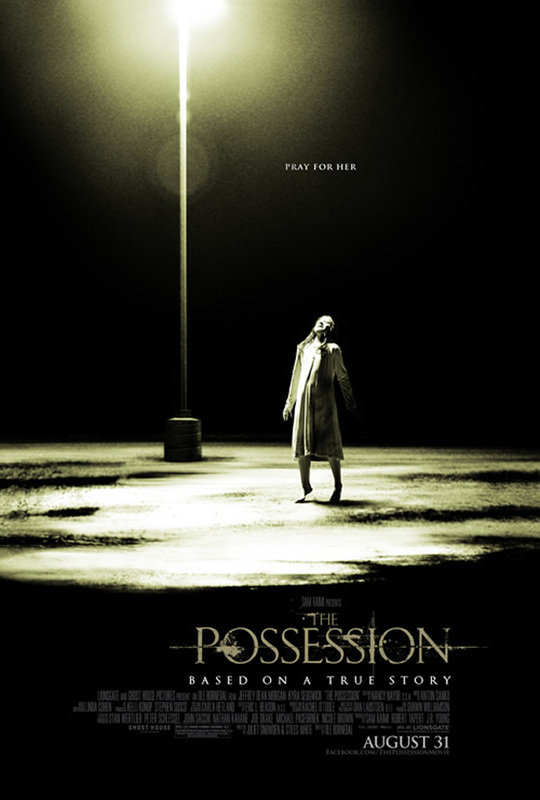 “Pray for Her,” reads the headline in The Possession poster. But why should anyone bother praying for “her”? Because the young girl in question has been possessed by a spirit – a dibbuk – that may eventually destroy her soul. Apparently a mix of The Exorcist, The Exorcism of Emily Rose, Audrey Rose, Poltergeist, and The Host, The Possession is purportedly based on a true story about a young girl who becomes obsessed with an antique wooden box. Lionsgate will release the horror drama on August 31 in the United States. Natasha Calis plays the girl; Jeffrey Dean Morgan and Kyra Sedgwick are her parents. Nightwatch's Ole Bornedal directed from a screenplay by Juliet Snowden and Stiles White. Spider-Man's Sam Raimi is one of the film's producers. The Possessed's poster was found at Fearnet.com. 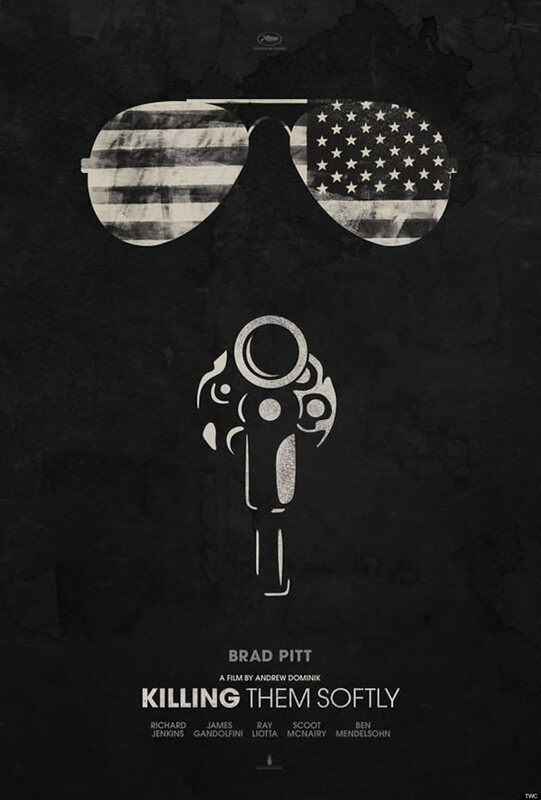 Andrew Dominik's Killing Them Softly, Dominik's first film in five years, has a teaser poster. The New Orleans-set crime drama reunites the The Assassination of Jesse James by the Coward Robert Ford director with that film's star, Brad Pitt. In Killing Them Softly, Pitt plays professional enforcer Jackie Cogan – not to be confused with The Kid's urchin Jackie Coogan – who investigates a heist that took place during a mob-backed poker game. The film's title refers to the way Pitt's Cogan performs his killings. For those who don't know: an enforcer is a hired thug who uses violence to get his/her victims to do what they're told. The methods of this particular enforcer apparently represent the American way of life, or something along those lines, as can be attested by his patriotic shades. In addition to Brad Pitt, Killing Them Softly features Scoot McNairy, Ben Mendelsohn, James Gandolfini, Richard Jenkins, Ray Liotta, Max Casella, Vincent Curatola, Sam Shepard, Trevor Long, and Garret Dillahunt. The film is based on George V. Higgins' 1974 novel Cogan's Trade, not to be confused with the 1968 Clint Eastwood cop thriller Coogan's Bluff (or, for that matter, with Eastwood's 1976 Dirty Harry thriller The Enforcer). Killing Them Softly, which will be screened on Tuesday at the Cannes Film Festival, opens in the US on Sept. 21 via The Weinstein Company. That means the following: expect Killing Them Softly to make a splash next awards season. Nick Stahl has gone missing, according to various online sources citing a police report filed by his wife. Stahl's wife hasn't heard from her estranged husband in five days. She says Stahl, 32, was last seen in the vicinity of downtown Los Angeles' Skid Row on May 9. Stahl, who reportedly has serious drug issues, has suffered a series of setbacks in the recent past. For starters, Fox passed on the Mark Romanek-directed Locke & Key in spring 2011. After refusing to pay for a cab ride, Stahl spent a night in jail last January. That same month, he and his wife separated. She later requested to the court that his visits to their two-year-old daughter be monitored, and that Stahl be tested for drug use 24 hours before seeing the infant. Among Nick Stahl's most important film roles are those in Terminator 3: Rise of the Machines, with Arnold Schwarzenegger; the Academy Award nominated In the Bedroom, as Sissy Spacek and Tom Wilkinson's murdered son; Larry Clark's Bully, starring another drug-use victim, Brad Renfro; and the HBO series Carnivale, which lasted a couple of seasons. In the last couple of years, Nick Stahl has kept himself busy starring or playing featured roles in a series of low-budget productions. Among those are Dead Awake, The Speed of Thought, 388 Arletta Avenue, Meskada, and Everything Will Happen Before You Die. As per the IMDb, Stahl has three acting projects in various pre-production stages: The Unknown Son, American Dream, and Away from Here. Earlier this year, Stahl guested on two television shows, House of Lies and Body of Proof. 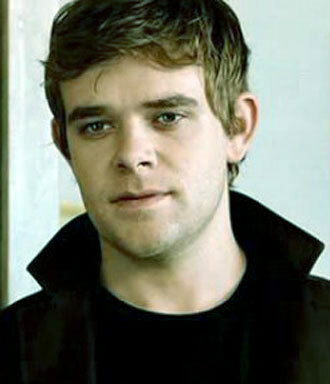 Nick Stahl / The Speed of Thought picture: Highland Film Group. Les Miserables is not by Andrew Lloyd Webber.